As usual, I'm always enthusiastic to bake and so let's talk about baking first! "We're not trying to be cool but store may close earlier if goods are sold out." Geez! In actual fact, the bakery is so truly successful that I have seen many generic Jenny cookies selling everywhere in Hong Kong. So successful that Jenny Bakery has opened a branch in Singapore and is equally popular too. Knowing that it is going to consume a lot of our travelling time queuing for the real Jenny Bakery cookies at both Hong Kong and Singapore, I told myself that I will not queue hours and hours for Jenny Bakery Cookies. Well, you can say that I'm Ya Ya papaya (meaning arrogant in Singlish)... LOL! as I believe it won't be that difficult to bake cookies that are as good as Jenny's. Surely, there must be a copycat recipe!!! And I'm totally right. My Google search for "Jenny cookies recipe" has lead me to heaps of recipes like this, this, this, this, this, this, this and many more... Geez! Can someone tell me which recipe is the best? Or which recipe makes the most Jenny's like cookies? Looking at the recipes closely, I found something!!! Can someone tell me which is the Best Copycat Jenny Bakery Butter Cookies? 1. 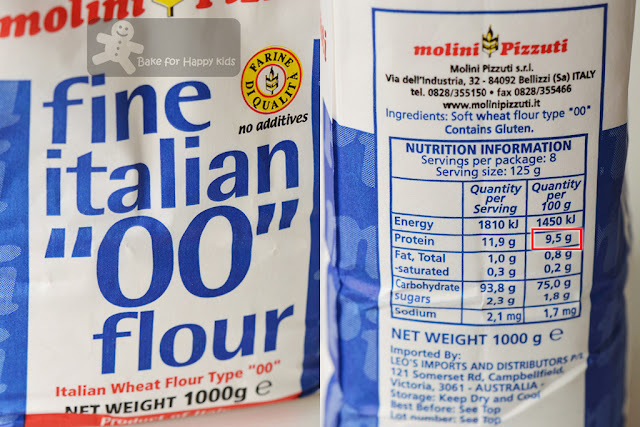 What is the gluten (protein) content of the flour? 2. Are the flour finely milled? 3. Is the addition of non-wheat flour with low protein content make a nicer cookie? What is the optimal amount to add? 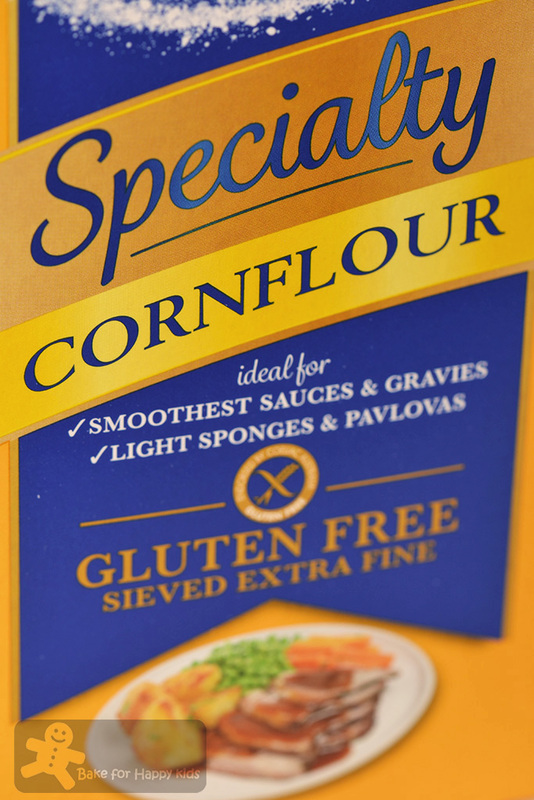 Should I use cornflour or rice flour? Obviously, the use of flour with higher protein content will create a cookie with more mouthful structure... meaning more to munch and easier to handle. On the other hand, the cookies made with less protein content will melt more in your mouth but will be difficult to handle. What is the idea amount or combination to use? All recipes except The Yummy Journey have not mention the percentage of protein in the flour that they used as all that they mentioned are all purpose, plain, top, wheat, strong, bread flour and etc. All recipes except The Yummy Journey use 3:1 ratio of wheat:non-wheat flour. Instead of using a typical ratio, Gingy (from The Yummy Journey) calculates the amount of cornflour that she needs to use based on the protein content of the flour that she used which I think it is a brilliant idea! (1) all purpose finely milled unbleached "OO" flour with 9.5% protein with extra fine cornflour mixed in a typical 3:1 wheat:non-wheat flour ratio. (2) a combination based on what The Yummy Journey has mentioned. She used 147g flour with 11% protein out of the total 150g flour that she used has to be 11% protein to mix with 150g butter. Based on this recipe, I have worked out a recipe that contains the same amount protein in her recipe and see if the significantly higher amount of gluten can make better cookies. This is the finely milled all purpose Italian OO flour (with 9.5% protein) that I used. And I have mixed the all purpose flour with this cornflour in 3:1 ratio. I was told that I MUST USE Golden Churn Tin Butter. Why can't I use regular unsalted butter? It is almost impossible to buy golden churn butter in Australia and I had to buy mine via online from New Zealand. Just a small can (340g) of butter costs me about AUD$20 with shipping!!! So expensive! And so I called the distributor and found that Golden Churn butter is actually available as Red Feather butter in Australia. Eventually, I managed to buy each can (454g) for AUD$8 but they are available in a very few fine food shops in Melbourne suburbs! Can you imagine there is no shops in the Melbourne city that want to sell this butter?!!! Why is the canned butter so special? 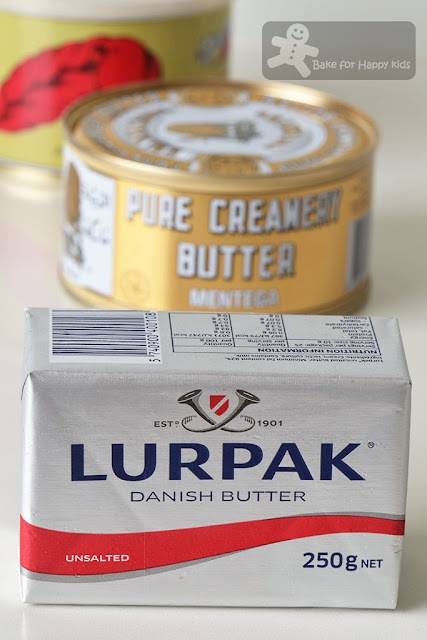 I examine both butter very closely and see that both the canned butter and all the regular butter that we buy in the supermarkets are almost the SAME!!! 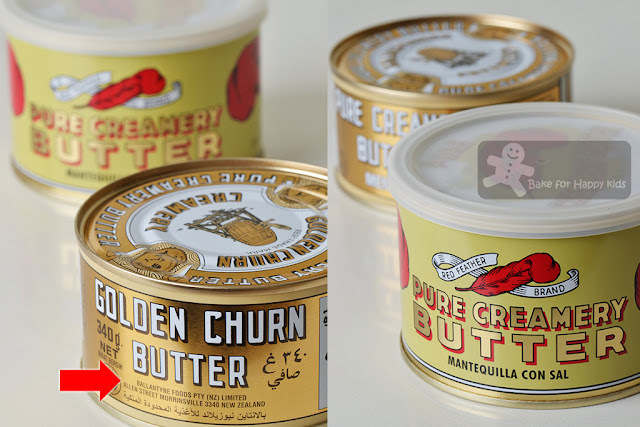 The only difference is that the canned butter is heavily preserved with added salt and this is why golden churn / red father butter are very salty! Yes that I'm going to use golden churn / red father butter to bake the cookies but will like to know if I can use regular unsalted butter to bake these cookies too. Hence, I'm testing another combination (3) which contains all purpose finely milled unbleached "OO" flour with 9.5% protein with extra fine cornflour mixed in a typical 3:1 wheat:non-wheat flour ratio, all mixed with the regular unsalted butter plus salt. 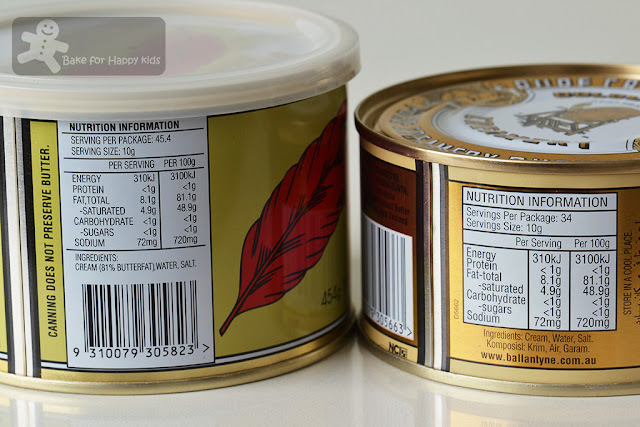 These Golden Churn / Red Feather New Zealand canned butter are from the same supplier (see the red arrow). Both are exactly the same in their nutritional contents. They are almost the same like the regular butter! The only difference is that the canned butter contains 720mg sodium in every 100g and the unsalted butter has 0g in every 100g!!! Do not beat the butter excessively! Over mixing can make the cookies spread too much during baking. Mix until the flour is just combined. Do not over mix as over-mixing will toughen the cookies. These cookies are more stable in their structures and shapes. Despite that they contain slightly lesser icing sugar, they brown so much better. OMG! The cookies look ghastly!!! Don't ask me why... but clearly, the use of canned Golden Churn butter to bake this recipe is totally essential especially if you are baking the cookies with all purpose flour (with 9.5% protein) + cornflour in a typical 3:1 wheat:non-wheat flour ratio. If you are not adding cornflour into your recipe, it is totally ok to use regular unsalted butter, softened at room temperature - See this recipe! "Why are the cookies so salty??? Can't taste any differences leh!!!" My husband didn't like the excessive salty taste in these cookies. He felt that the salty taste is too overpowering and has made both cookies taste equally bad! "This is like eating flour mix with butter..." My son said the cookies made with low protein flour is too melty for his taste. "Mum, confirm that this one is better!" said my confident son, pointing to the cookies with high protein content. You know what? I agree with them too. Due to the fact that I have not taste the real Jenny Bakery cookies before, I can't say which recipe can make cookies that taste more or less like Jenny Bakery cookies. 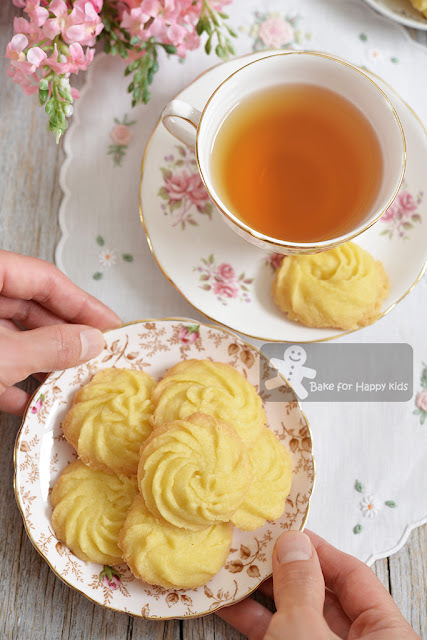 All I can conclude is I would strongly recommend baking butter cookies with this recipe (a well tried and tested butter cookies recipe that you can use all purpose flour and regular unsalted butter for baking) or the recipe that The Yummy Journey has recommended. Our winner: The cookies with higher amount of protein content. Or if you like something that is extra melty, you would prefer the other low protein flour recipe. 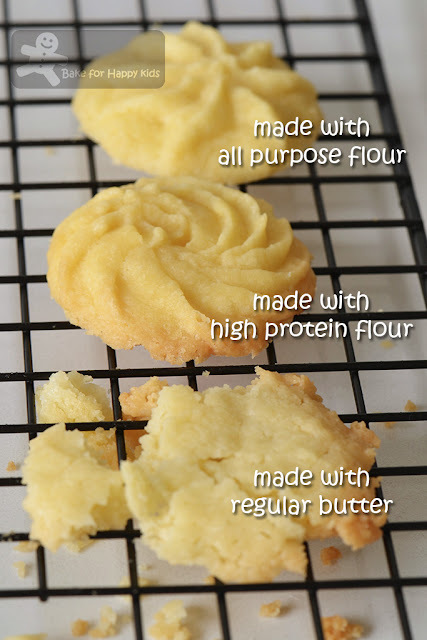 Once again, I like emphasize that I still prefer baking butter cookies with this recipe using the usual unsalted butter for baking. Nevertheless... 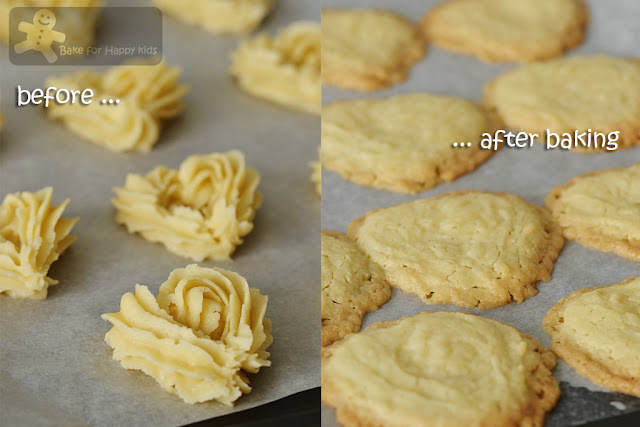 Whether Jenny's like or not, I believe that everyone can bake nice butter cookies at home. Oh yeah... definitely! And I will not queue to buy butter cookies... LOL! First, I like to thank Joyce from Joy `N' Escapade and all the participants for taking part the Little Thumb Up (Honey) event. We have a total of 104 entries linking with us. Thanks Joyce! You are an awesome hostess!!! Next, I like to broadcast that I'm going to be on TV!!! So Exciting!!! This is Vivian Lai, me and Ben Yeo (from left to right) at Mediacorp studio filming an episode of channel 8 TV cooking show, 弹指间的料理 screening on every Wednesday, 8 to 8.30pm. 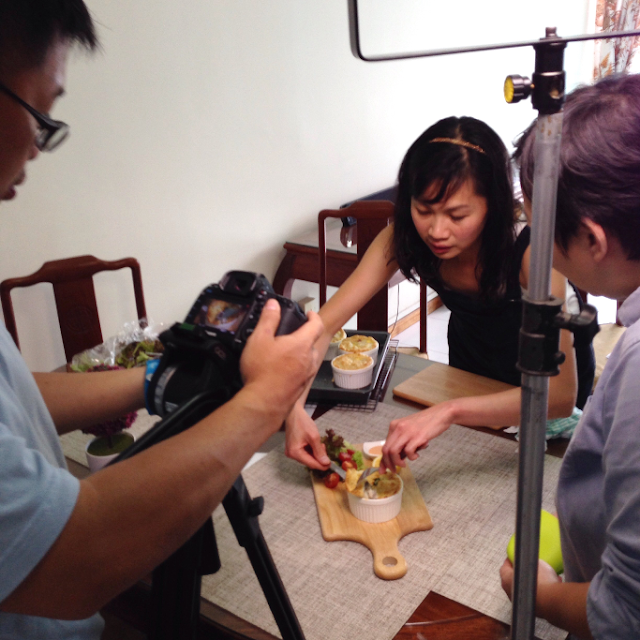 Touch-Screen Cuisine 弹指间的料理 is a brand new variety show, started on 6 April, every Wednesday on Singapore mainstream TV Channel 8! On every episode, one Mediacorp celebrity will be invited to cook with one featured cooking blogger to see if the celebrity can cook the same food using the recipe that is published by the blogger. This is me again doing a profile filming for the same show, 弹指间的料理 at my brother's place. Hope to have your support and please stay tune for my appearance in this show. 200g unsalted butter, very softened - very important!!! 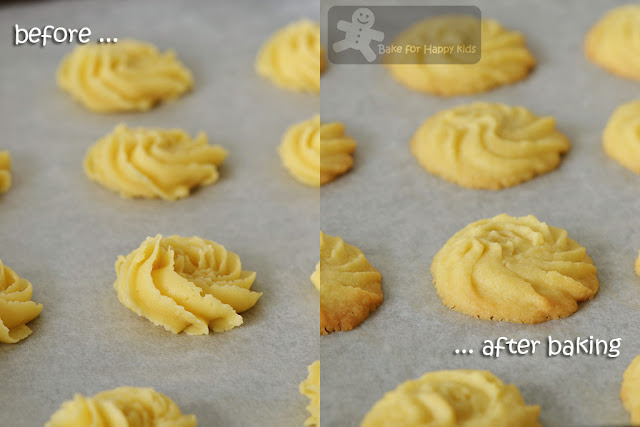 I can tell you... this recipe can make butter cookies that are so much nicer!!! Using a wooden spoon or an electric mixer with paddle attachment, cream butter and icing sugar until smooth and just combined. Note: Creaming mixture excessively can make the cookies spread even more during baking. 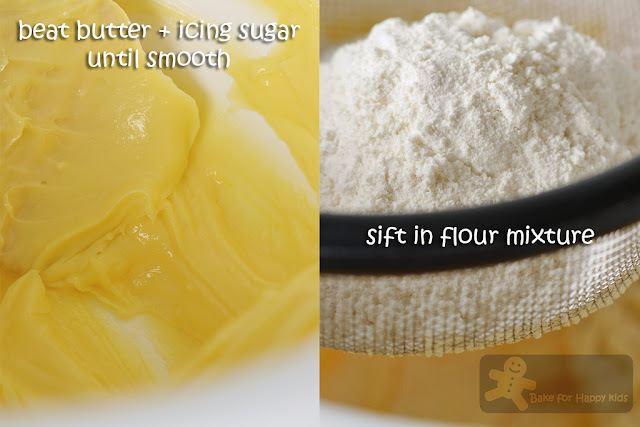 Combine flour and corn flour and sift mixture twice. 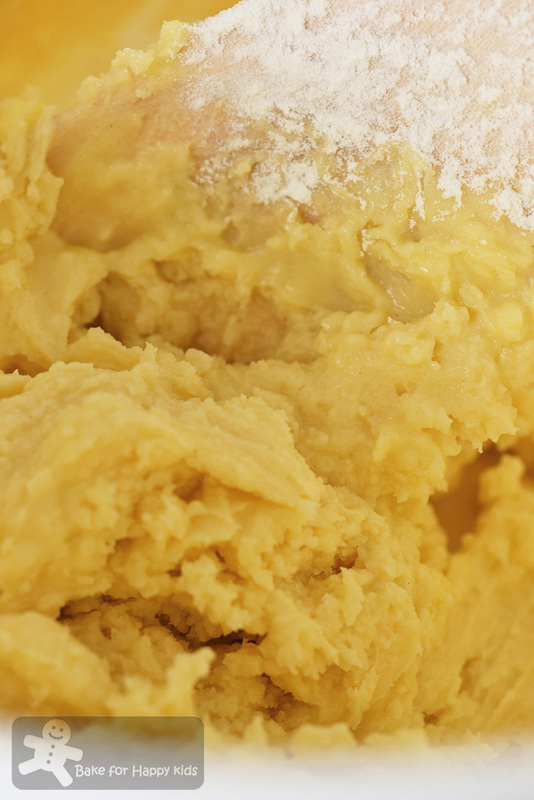 Add flour mixture into the butter mixture and use a spatula or a wooden spoon to mix until all are well incorporated. Do not use an electric mixer to mix at this stage as over mixing will make the cookies to be tough. Transfer dough into a piping bag fitted with a star nozzle. Pipe the cookies onto the prepared tray with about 1 cm in between cookies for them to expand during baking. Bake for 12-15 mins or until the cookies are light golden brown. Please note that the cookies made with recipe two will brown better than the cookies made with recipe one. Leave them to cool slightly on the baking tray for about 10 mins and transfer them onto a wire rack to cool completely. Store in airtight container in room temperature for about 1 week. Thanks for the detail analysis of the the cookies. I've tried the original and tried baking some myself too. I also find there's nothing really fantastic about the HK cookies, I think our cookies don't differ much too! I'll be watching out for you in our tv show! Congrats for being featured! 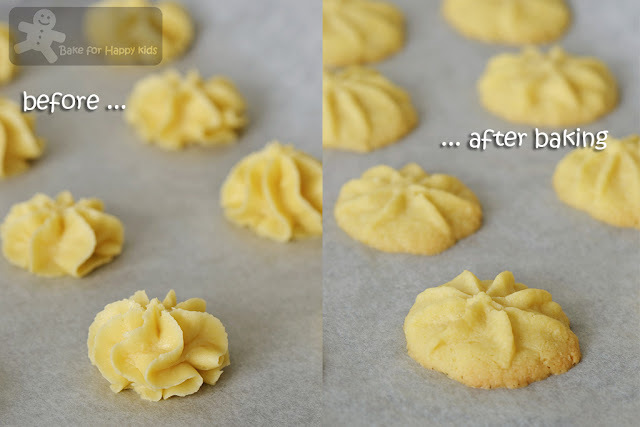 Yes, we all can bake nice butter cookies at home! You look so sweet there Zoe! Oh yes, I recognize Ben.. Butter cookies, yay! Am bookmarking this.. Yummmzz, can see they melt in the mouth..
Protein%= protein/ serving= (9,5 g x 100 %)/ 125 g ( serving size) = 7,6%. I don't know the different of % here would make any other different... Sorry...just want to share...please correct me if I m wrong. That is the way I calculate % on label . I hope you don't mind i share here...thanks. congrats for being featured in TV show! isn't really taste that salty on the cookies? Will definitely watch that episode. Zoe, I am surprised that Golden Churn butter is not available in Australia. I thought it is made in Australia? Anyway, I love this butter but it is very pricey over here. I do hope you get to taste the Jenny Bakery butter cookies to confirm what the hype is all about. Hey, wish I could see you in action on TV! Your butter cookies are so elegant. Hello Zoe, would love to watch you in action, but I don't think that's possible as I am not in Singapore. Love your analysis on the famous cookies, in fact I am baking a tiny batch now!Anyway, congrats and all the best! You looked great and so beautiful! Guess I have to catch up via Toggle as working late on most weekdays. Back to the butter cookies ... I've tasted some bought from HK by my niece. Very fragrance but not my type cos too buttery for me. Thanks for sharing and I'll hope to bake some as giveaways gifts during festive season. ooooooh, you are going to be celebrity? congrats!!! yey!!!. love these cute cookies. Hi, the cookies look lovely!! Just wonder why not use cake flour? Hi Zoe thanks so much for the detailed analysis of the butte cookies. They look so yummy! By the way I bought canned Golden Churn butter from KFL Supermarket in Springvale before. There is a new KFL in Doncaster but I am not sure if they have it there. Love, love your blog. Never tried Jenny's cookie either but something tells me they use more than just butter to achieve that addictive butter fragrance and texture. HK chefs and patissiers are old school in that way-- relying on hydrogenated fats and chemical stuff to produce that addictive taste we can't resist. These cookies look perfectly buttery! Hi, may I know, is your 3rd recipe n the Vietnamese butter cookie the same? Thank!! The 3rd recipe is the same as the 1st recipe but I have used regular butter instead of the canned one. 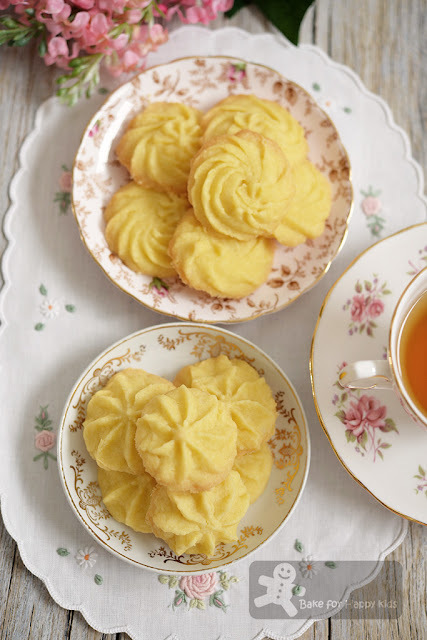 If you prefer to use regular butter (not the canned butter to bake your cookies), I would strongly recommend using the Viennese Biscuits recipe (not Vietnamese lah!!! 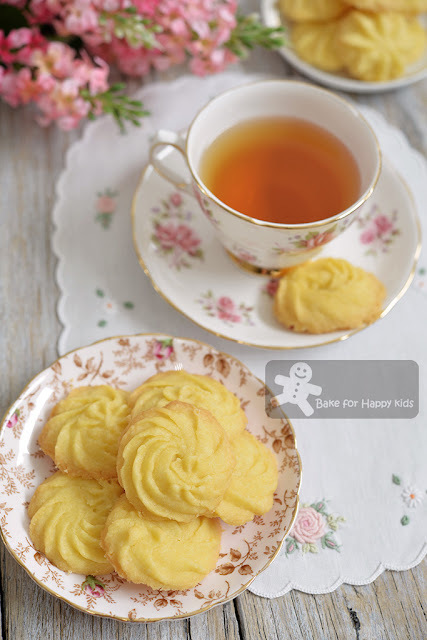 :p) at http://www.bakeforhappykids.com/2015/04/melt-in-your-mouth-viennese-biscuits.html Cheers! The canned butter is very salty is it? Yes. The canned butter tastes salty. Hi Zoe, is this recipe possible using cookies cutters? Wanna bake some for Christmas! The cookie dough made with these recipes is too soft to roll and cut and I don't advise you to do that. Hi Zoe! Just tried out this recipe but it turns out quite salty. Can I increase the sugar levels? And my cookies turns out rather flat than keeping its shape. Something I did wrongly? The use of golden churn salted butter will make the cookies rather salty and if you think that your cookies are too salty, you should use regular unsalted butter and use the recipe that uses regular unsalted butter. I don't think you should increase the addition of sugar as it will make cookies less melty in texture. If your cookies turns out to be flat, it could be that 1) you didn't weigh the ingredients accordingly 2) the flour that you used is too low in its protein content 3) the cookie dough is not thoroughly mixed and the part with more butter turns to melt more and fell apart. Hope that you will succeed baking these cookies. Happy Baking!